The last in the Duplais series from Matter-Luginbühl and Markus Lion of Absinthe.de. The name is a tribute to Jhonn Balance. The last one in the Duplais series from Markus Lion and the Matter-Luginbühl distillery. 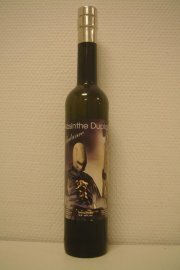 The name Balance is used as a tribute to Jhonn Balance but is also an excellent name for this product given that the aroma, taste and overall profile of this absinthe is in complete balance. Seriously this one is a bargain! As with the other Duplais absinthes it louches up perfectly when adding water to it and the aroma stays equally good after water is added. The lower alcohol level of course helps to keep this "balance" since the alcohol doesn't show through the herbal profile too much. So, how does it taste then? Well - actually it tastes just as good as everything has lad me to believe. Its taste is actually quite unique in a way given that the extreme clean and crisp character manages to bring such a complex and rich drink. It's truly special. To make a comparison to another of my favorites - the Jade PF 1901 - this one is a "lighter" absinthe than that one. Not light in taste or character but the overall profile is lighter in a way that makes it an ideal "every day drink". Whereas the PF 1901 is a deeper more robust sort of absinthe. Two very different absinthes yet with some similarities and both of excellent quality. The Duplais Balance is a must buy, really. At a price you can't walk away from and excellent quality I really do recommend it.